A Jane Usher Boulevard resident was convicted this for harming a teenager. 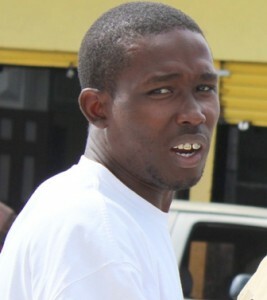 He is thirty year old Glenford Brown, who was accused of hitting nineteen year old Tanisha Bodden with a rake on August second. After being found guilty, the Chief Magistrate Ann Marie Smith remanded Brown to prison until December twenty-fourth, when he will be sentenced. In her testimony, Bodden told the court that when she was working with Restore Belize at a job site in the city, she asked Brown for a rake since he was the Supervisor. Instead, Brown hit her, causing injuries to her hip, eye and wrist. In his defense, Brown who was unrepresented, told the court that Bodden had provoked him and insulted his mother. Brown admitted to hitting her but said it wasn’t with a rake; he only slapped her. Grown man acting like a kid. This story doesn’t sound right…she went and ask for a rake & he just hit her???? I’m sure this guy isn’t crazy or just buck ih head that day. Some sort of “hard talks” happen between them or some kind of provocation…where is the rest of the story???? Stupid reaction to escalate an insult to going to jail. He was the supervisor, too, so presumably he had the authority to discipline her or just make her life miserable. A man should never hit a woman. Dont matter what kind of woman she is. (remember you came out of a woman). Call the police and let them deal with her. If you could get them only with insulting words imagine if she hit you?. The shooters are running around town free as a bird while we occupy the prisons with someone who hit someone with a rake…….Do u all see something wrong with this picture? @billgate. Are you talking about the rib? That is b.s. Here and in china. You sound like someone hurt you bro. For your info Iam NOT a woman. I love them dont matter what. If you dont like the way I think thats your problem.